From The 1st Century B.C. 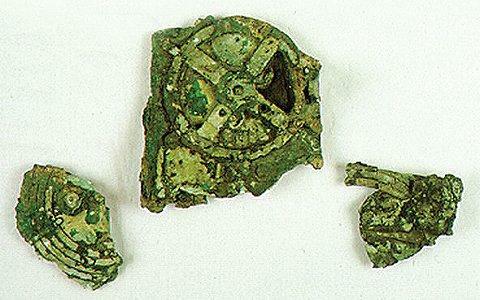 Update: Researchers have long suspected the ancient clockwork device was used to display astronomical cycles. A research team (Mr Freeth and his colleagues) has now found that one of the dials records the dates of the ancient Olympiad. The ancient Olympiads, called the Panhellenic Games, comprised four games spread over four years. The Antikythera Mechanism was found in swallow water off the coast of the Greek island of Antikythera, and that is how it got its name. Antikythera Mechanism is now understood to be dedicated to astronomical phenomena and operates as a complex mechanical "calculator" which tracks the cycles of the Solar System. The Antikythera Mechanism dates from around the 1st century B.C. and is the most sophisticated mechanism known from the ancient world. Original bronze fragments of the Antikythera Mechanism, including the largest, Fragment A (center). Together, some 85 fragments reveal a highly sophisticated mechanism with about 30 bronze geared wheels and plates, apparently to calculate the time and positions of various planetary, solar, and lunar events. It was also able to follow the movements of the Moon and the Sun, predict eclipses and even recreate the irregular orbit of the Moon. The mechanism predicted lunar and solar eclipses on the basis of Babylonian arithmetic-progression cycles. Calendars were important to ancient societies for timing agricultural activity and fixing religious festivals. Eclipses and planetary motions were often interpreted as omens, while the calm regularity of the astronomical cycles must have been philosophically attractive in an uncertain and violent world. Reference: National Archeological Museum of Athens, Greece. Where on earth is Antikythera? The Antikythera island lies 22 nautical miles south of Kythera and 18 miles north of Crete, in a location that controls the passage from the Aegean towards the open sea of the western Mediterranean. The only useful anchorage of the island is in the Bay of Potamos, exposed to the prevailing northerly winds. Archeological finds show that the oldest settlement on the island was established in the late Neolithic period and the early Bronze Age, or 4000-3000 BC. Antikythera has had many names in its history. Its ancient name was "Aigila" or "Aigilia". Subsequently it became known as "Lioi" and "Sigilio", names that were used until the seventeenth century. From the eighteenth century on it was called "Cerigotto". (The larger island of Kythera was then called "Cerigo", thus Cerigotto meant "little Cerigo"). The name Antikythera came later.